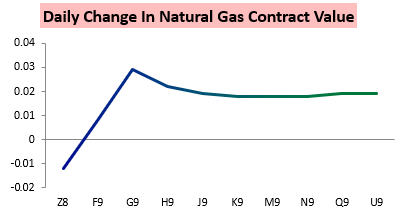 It was a much slower day in the natural gas market, as we saw the December contract settle down a bit less than half a percent with strength further out along the curve. In what was a new development for the market the February contract ended up taking the lead today. The result was a quick reversal in the Z/F December/January spread today after a spike higher yesterday. 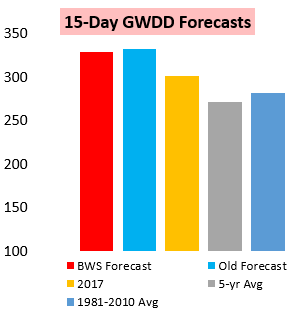 A slower trading day was not particularly surprising, as in our Morning Update for clients we noted a slight tick lower in forecast GWDDs that could help keep prices in check. We did outline …”risk up to $3.6 on any cash strength” but also that “long-range warm risks have ticked up from yesterday” which would prevent much more of a run-up in prices. 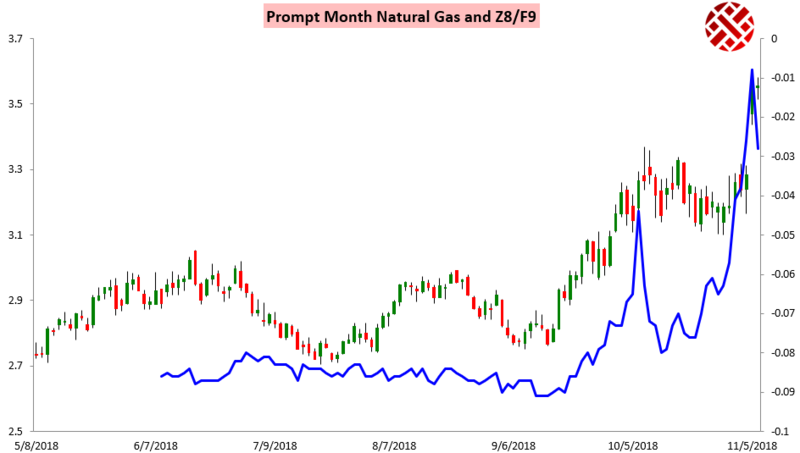 The December contract got up to around $3.58 before pulling back later in the day, though afternoon model guidance did increase medium-term cold intensity, as seen on recent Climate Prediction Center probabilistic forecasts. For clients today we released our updated Seasonal Trader Report, which puts into context this November cold shot and outlines how long we expect this cold to last, how temperatures should trend into December, and how temperature risk is skewed through early 2019. In it we looked at the latest CFSv2 forecast for weak El Nino conditions through the coming winter, putting it in context of other model forecasts and our expectations. 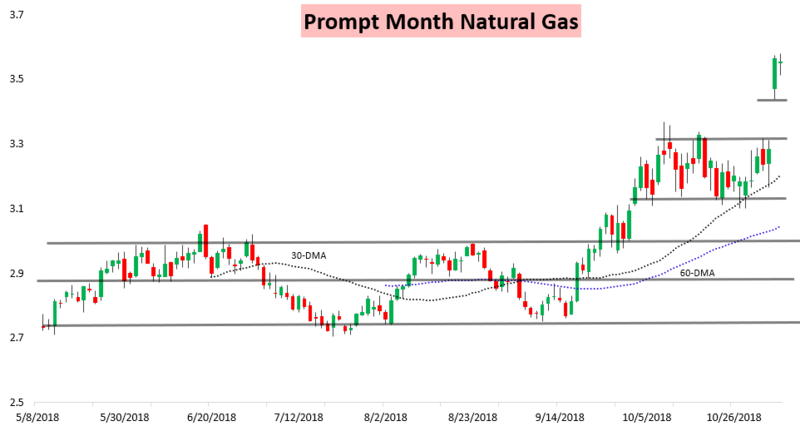 We also held our subscriber-only live chat on the Enelyst platform, where we looked at the latest natural gas balances, 3-week and 5-month weather forecasts, and outlined our price expectations moving forward. One data point was a recent dip in LNG exports following near-record levels over the past weekend. It was certainly a busy day and we see quite a lot of model volatility ahead as well, as outlined to our clients in our Afternoon Update where we explained the latest weather model trends as well as where we expected models and gas prices to trend into the end of the week.